Up until 1934 there was a separate Bugatti model for almost every body type. To cut costs Ettore Bugatti decided to design one chassis that would be available with various body styles. Most of them were to be designed and constructed in the Bugatti factory. In charge of the new model's design team was Ettore's son, Jean Bugatti. He was just 23 years of age when the 'Type 57' project started in 1932. Extremely expensive models like the Type 41 Royale and the Type 50 had not been a success. With that kept in mind Jean Bugatti designed a much smaller engine for the Type 57 than found in the Type 50 it replaced. The prototype engine displaced 2.8 litres, which was almost half that of Type 50's. The new engine was equipped with double overhead camshafts, similar in construction to those found on the Type 50 and Type 59 racer. The production engine displaced just under 3.3 litres and produced 135 bhp in Naturally Aspirated form. In the first models the engine was directly bolted onto chassis, which added to the rigidity of the ladder frame. In 1936 a second series was introduced which featured a strengthened chassis, because the engine was now mounted on rubber bushings. When Ettore Bugatti saw the prototype's independent front suspension, he immediately ordered the installation of a solid axle, which was used in every other production Bugatti. Friction dampers were fitted on the first batch of cars, later models were fitted with telescopic shock absorbers. At its launch four bodytypes were available for the Type 57. Three of these were named after mountain peaks in the Alps; the four-seater, two-door 'Ventoux', the four-door 'Galibier' and the two-door 'Stelvio' convertible. Unlike the other bodies, the Stelvio body type was designed and built by French coach-builder Gangloff. The fourth body was dubbed Atalante and was the two-seater coupe variant. With a price twice as high as that of the least expensive Type 57, the Atalante was the most exclusive body of the lot. Its characteristic features were the 'kidney shaped' side windows and the split rear window. 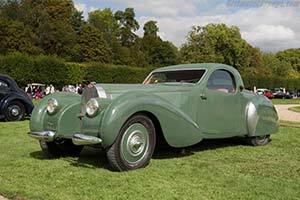 For the sportier clients two improvements were added to the Type 57 line-up in 1936. First off was the addition of a Supercharger which boosted the power from 135 bhp to 160 bhp. Secondly a shorter and lower 'S' variant was launched, equipped with more powerful versions of the Naturally Aspirated and supercharged engines. Production of the 'S' lasted just three years, but the 'regular' Type 57 and 57 C lasted up until the outbreak of the Second World War. In total 546 Type 57s and 96 57Cs were built.